Download "Proposal to be returned PRIOR to time and date above." 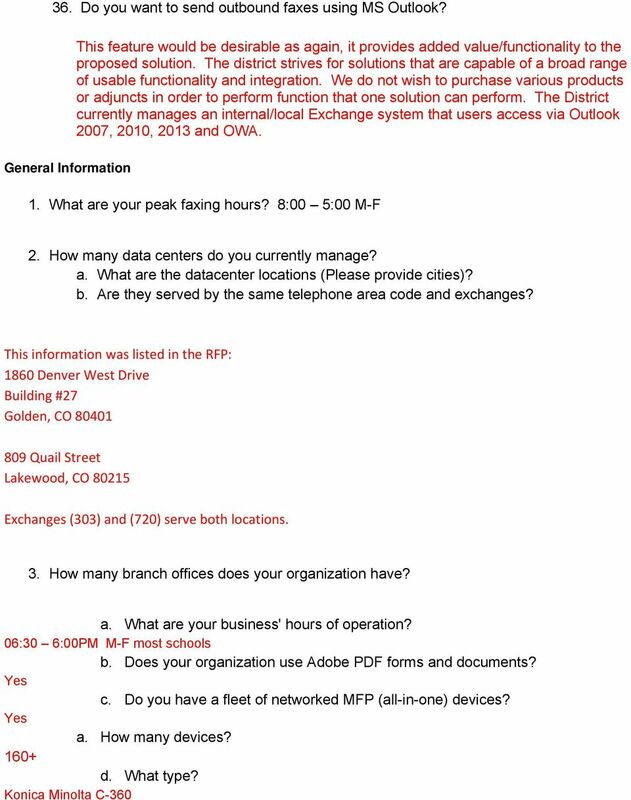 1 DISTRICT FAXING SERVICES Addendum No. 1 to Request for Proposal (RFP) # Date of Issue: August 6, 2014 Date of Addendum: August 13, 2014 RFP Close Date: August 27, :00PM (our clock) Proposal to be returned PRIOR to time and date above. RETURN TO: Holly Callero Penny, CPPB Jefferson County School District R-1 Education Center, Purchasing Dept Denver West Drive, Bldg #27, 3 rd floor P.O. 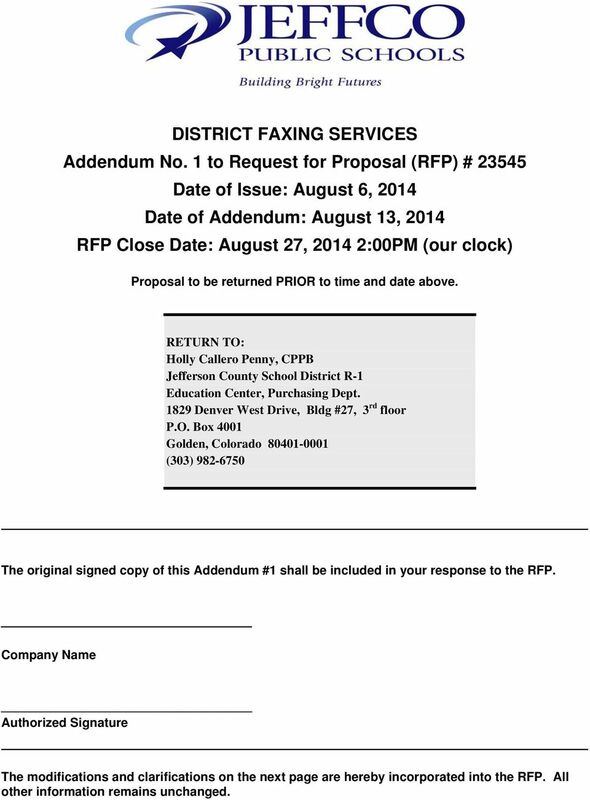 Box 4001 Golden, Colorado (303) The original signed copy of this Addendum #1 shall be included in your response to the RFP. Company Name Authorized Signature The modifications and clarifications on the next page are hereby incorporated into the RFP. All other information remains unchanged. 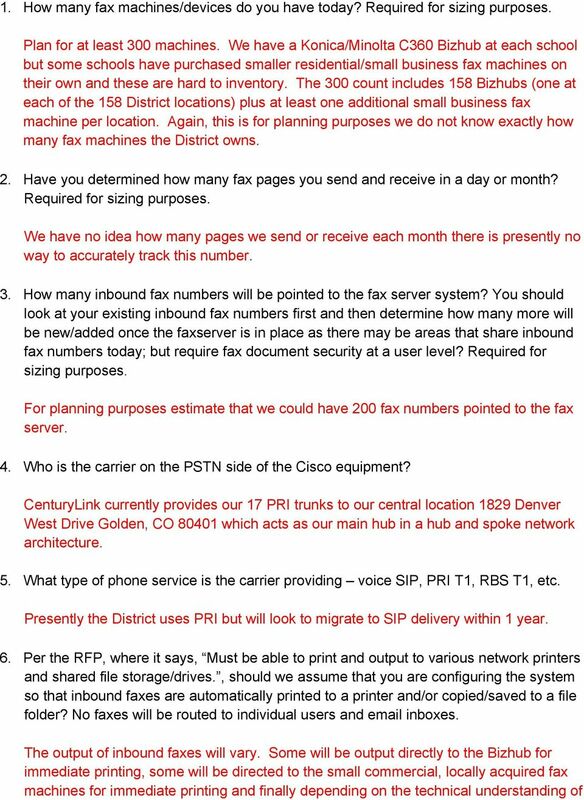 3 the end user some inbound faxes will be directed / ported to an individual mail box or Per the RFP, where it says, configured such that no data/images is/are stored what are you proposing for immediate (being where does the inbound fax route to , file folder, printer, etc.) and long term storage? INBOUND: inbox (short term, user controlled storage) and/or ECM/Document management system (long term, enterprise wide storage). OUTBOUND: ECM/Document management system (long term, enterprise wide storage; less concerned about outbound at the user level we can delete faxes as soon as they are delivered or not, the user can then receive delivery notification via and take action on undelivered faxes. For clarification, the District wants no centralized storage be it inbound or outbound images (on the faxing servers themselves). There will be no long term central/system wide storage of faxing images (in or outbound). An individual end user may store an individual fax on their hard drive however. User controlled storage will not be limited or prohibited. 8. 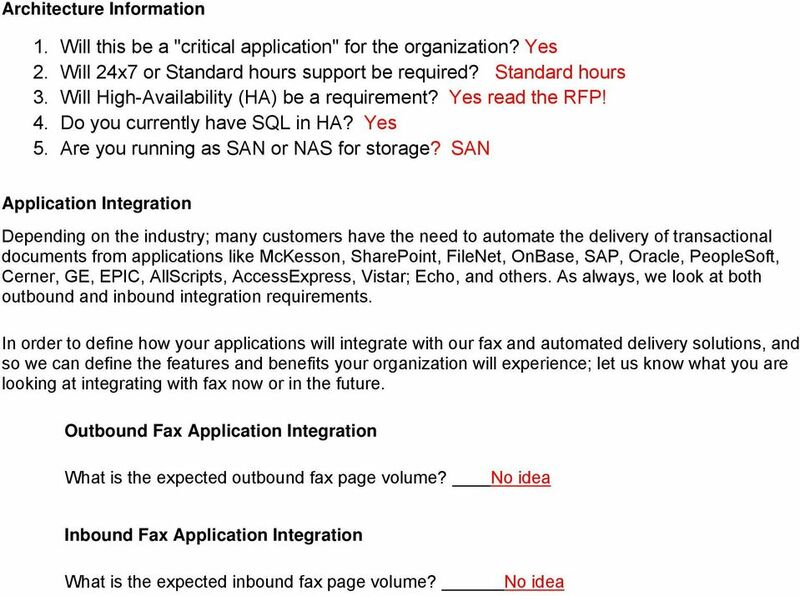 Per the RFP, where it says, Viability of the system to perform analog faxing over a VoIP network. 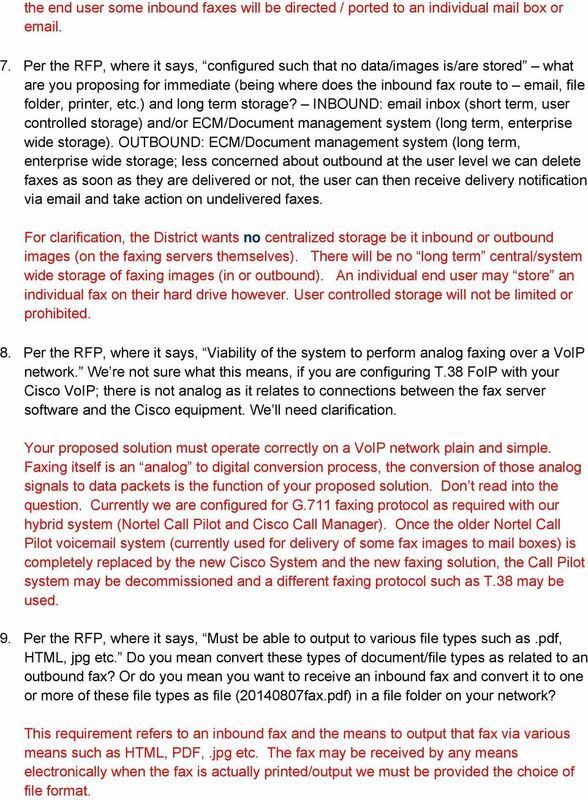 We re not sure what this means, if you are configuring T.38 FoIP with your Cisco VoIP; there is not analog as it relates to connections between the fax server software and the Cisco equipment. We ll need clarification. Your proposed solution must operate correctly on a VoIP network plain and simple. Faxing itself is an analog to digital conversion process, the conversion of those analog signals to data packets is the function of your proposed solution. Don t read into the question. Currently we are configured for G.711 faxing protocol as required with our hybrid system (Nortel Call Pilot and Cisco Call Manager). Once the older Nortel Call Pilot voic system (currently used for delivery of some fax images to mail boxes) is completely replaced by the new Cisco System and the new faxing solution, the Call Pilot system may be decommissioned and a different faxing protocol such as T.38 may be used. 9. Per the RFP, where it says, Must be able to output to various file types such as.pdf, HTML, jpg etc. Do you mean convert these types of document/file types as related to an outbound fax? Or do you mean you want to receive an inbound fax and convert it to one or more of these file types as file ( fax.pdf) in a file folder on your network? This requirement refers to an inbound fax and the means to output that fax via various means such as HTML, PDF,.jpg etc. The fax may be received by any means electronically when the fax is actually printed/output we must be provided the choice of file format. 4 10. How many fax machines or fax enabled multi-function copiers are in place today? See response to question #1 11. What brand of multi-function copiers are in use today? Have you standardized on a manufacturer? See response to question #1 12. Can you provide an estimate of the # of pages of fax sent and received on daily basis? (or weekly, monthly, etc.) See response to question #2 13. What system is used today? Is it hosted? = Microsoft Exchange, no it is not hosted. Locally/internally maintained & operated 14. How many different schools or business units would use the fax server? 158 District locations. Assume "business units/"departments/schools etc 15. Are you using PRI trunk lines or SIP trunking for telephony carrier services? Do they support the T.38 and/or G.711 protocols? PRI circuits are being used currently, G.711 faxing protocol currently configured. Within a year assume SIP delivery of DIDs/PSTN access. We can change to T.38 faxing protocol, if required, once the present Nortel Call Pilot system used for delivery of faxing is sunset. The ability to decommission the Call Pilot System is one driving force for this RFP/Faxing solution. 16. How many Biz-hubs are currently in place? How many fax machines are currently in place? 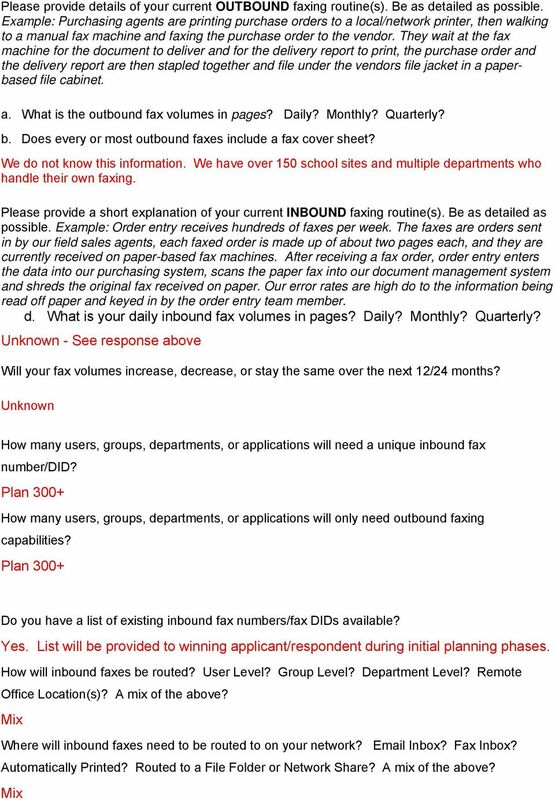 Plan for How many fax pages are sent and received each month? The District has no idea what our actual faxing volume is (Tx/Rx) and no means to track usage. 8 31. What type of telephone systems does your organization use today? Cisco Call Manager What type of telephone service does your organization use today? Centurylink PRI deliver (17) within one year plan on a migration to SIP 33. What is the approximate / estimated number of fax pages per month you expect to go through your system? The District has no idea the amount/volume of faxing that is done and no way to actively track the volume at present. 34. Are there peak fax times of the day/week/month? If yes, please describe. Our Business hours are from approximately 06:30AM until 6:00PM M-F. Faxing can occur at any time during our business day. We have not identified any peak times. 35. On page 8 of the RFP, under TECHNICAL SPECIFICATIONS, you state Integration with common Microsoft products and legacy District applications such as PeopleSoft, etc. Can you please describe how you want to integrate with common Microsoft products? We look to the respondent to explain to the District how and if their solution integrates with the District applications and process/s. 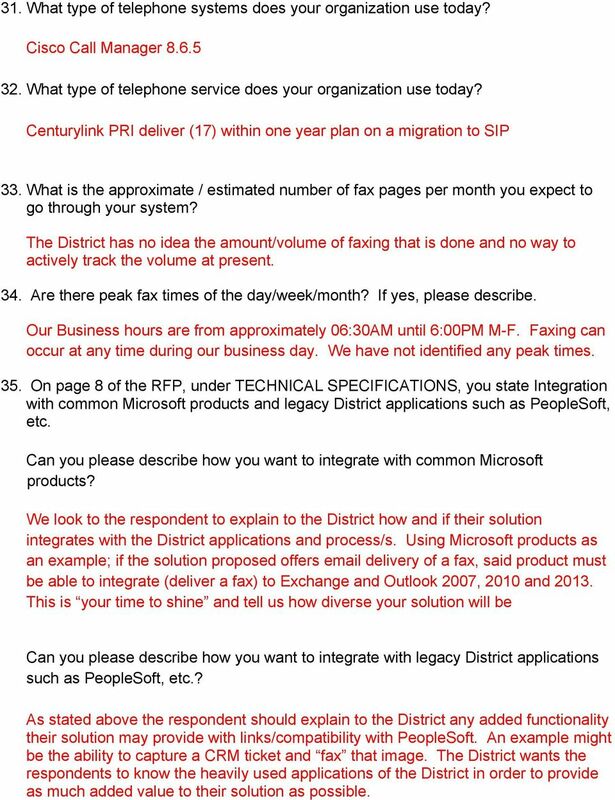 Using Microsoft products as an example; if the solution proposed offers delivery of a fax, said product must be able to integrate (deliver a fax) to Exchange and Outlook 2007, 2010 and This is your time to shine and tell us how diverse your solution will be Can you please describe how you want to integrate with legacy District applications such as PeopleSoft, etc.? 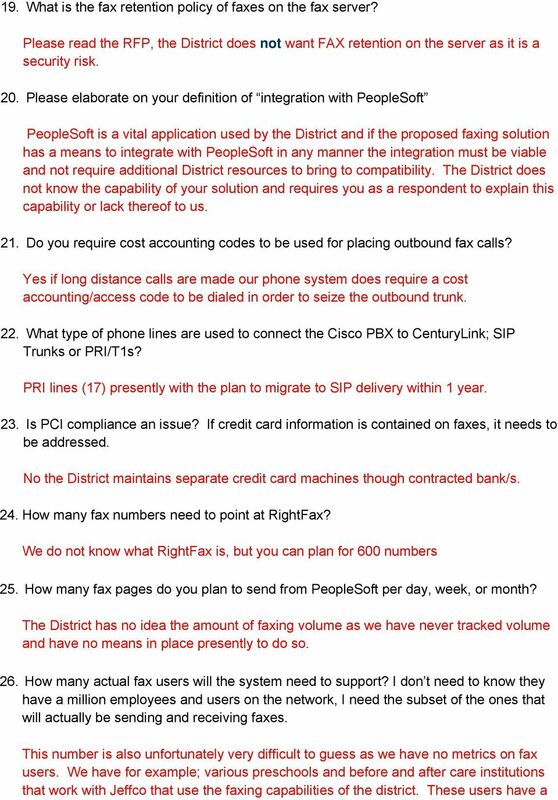 As stated above the respondent should explain to the District any added functionality their solution may provide with links/compatibility with PeopleSoft. An example might be the ability to capture a CRM ticket and fax that image. The District wants the respondents to know the heavily used applications of the District in order to provide as much added value to their solution as possible. 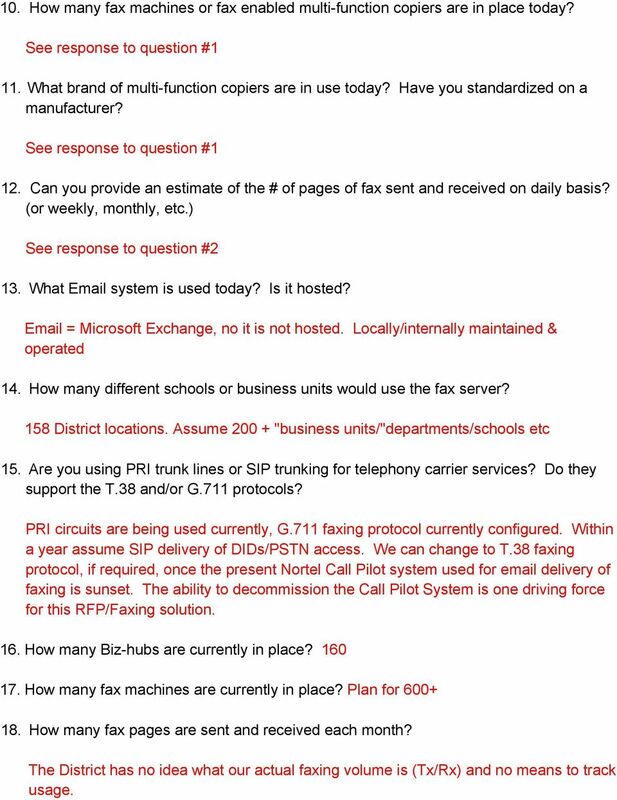 RFP 14-0022 Addendum #3 Districtwide VOIP System THE FOLLOWING CLARIFICATIONS TO THE ABOVE CITED SOLICITATION ARE ANNOUNCED. Purchasing Department 16550 SW Merlo Road, Beaverton, OR 97006 Phone: 503-591-4155 RFP 14-0022 Addendum #3 Districtwide VOIP System THE FOLLOWING CLARIFICATIONS TO THE ABOVE CITED SOLICITATION ARE ANNOUNCED. Please find detailed settings of virtual fax here. ZYCOO new generation IP Phone system---coovox Series (U20/50/60/100) support virtual fax. Virtual fax is an important feature to help enterprise reduce the cost and promote the efficient communication. Approximately 260 PST files totaling 180GB will be included in the pilot. 2. Are the Windows XP clients running XP 64 bit or 32 bit OS? Addendum #1 1. What is the count of PST files and total aggregate size of PST files that will need to be ingested for the pilot? Approximately 260 PST files totaling 180GB will be included in the pilot. Take back control of your business communications. Is SIP Trunking on Your Horizon? PageScope Enterprise Suite: interlocking solutions to manage your printer and MFP fleet more productively. Can the RFP, or the sections of the RFP that you are requesting responses on, be provided in MS Word so that it is easier to formulate our response? To IP or Not To IP That is the question As an end user you have many choices with regard to telecommunication including provisioning with PBX s converged PBX s or Key Hybrid systems or pure IP Telephony. SIP Trunking Checklist The Times, They Are A Changing The telephone network as we know it today, is going away. AT&T has asked the Federal government to shut it off no later than 2018. Should you be alarmed?